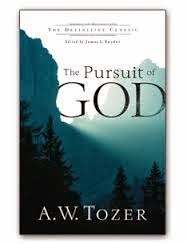 I chose the christian classic The Pursuit of God by A.W. Tozer for this month because I have intended to read it for years, and have just never gotten around to it. 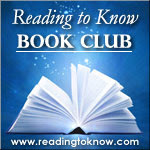 I thought the accountability of reading it with others for a book club might help me actually accomplish this goal. Like Paul, I want to know Christ and the power of his resurrection. I am good at knowing about God from what He reveals about Himself in His Word, but how well do I really know God? I have long heard admiration for Tozer's devotion to following God and leaving worldly things behind and I think there is much I can learn from his writings about developing a closer relationship with my Lord. I have also heard that he didn't have much formal education, but educated himself and I am always inspired by self-taught people. I have to admit I'm also a little intrigued about his biography, A Passion for God , which indicates he was so focused on ministering to others that he might have neglected the mission field of his own family consisting of his wife and seven children. If I have time, I may have to read both books. Will you be reading this with us? Please let us know in the comment section below! I'm going to give this one my BEST effort! I've pulled it off my shelf and like Amy I'm planning on giving this my best effort as well. It's been on my to-read list for a long time as well! I'm excited about this one! I've been told by a few friends that I should read something by Tozer, and this month is the perfect chance! Just checked to see if I have this one on my Kindle already (I didn't; boo). But I think I have a hardcopy around here somewhere so perhaps I'll join the reading this month! I've read this book but it's been a long time ago. I'm reading along - started the first chapter a couple days ago and feel like this is probably going to be a good and challenging read. I had been thinking all this time that I had read this one last year, but it was The Knowledge of the Holy I read. I did read this some years ago but I'll be glad to read it again as I don't remember much about it. It's free for the Kindle app at the moment - don't know how long it will be. @Barbara - Thanks for noting that it's free to download on Kindle (at this time). I thought I had a copy of it myself, but it turns out that I did not! So I quickly downloaded it. Oh, and Carrie, if you want another reason to "poke fun" at me for wanting other people to read what I'm reading (and discuss it with me), I'm inviting you to read a book I recently finished reading and reviewing: The Other Wes Moore, One Name Two Fates. I've watched others join your book club for months now, and I've joined in once last year, but I want in on this month's selection! My husband is a pastor and loves to read Tozer, but I've never read any of his books, so I'm going to jump in with this one. Thanks! I picked up my copy yesterday so now I can start reading! Woohoo!! The problem with classic Christian books is that you can't get them from the library (most of the time), but I was overjoyed that this is one I happen to have! I'll be reading along.